CARLSBAD — The city is eyeing the future. Scott Donnell, city planner who oversees the proposed project, presented a draft master plan to the City Council regarding the Village and Barrio neighborhoods for development and land uses. No action was taken as Donnell said the matter would not be ready for the council’s approval until next year. “The council has established as a priority a revitalization of the Village,” Donnell said. The plan, he added, is broken into four parts including vision, code, design guidelines and an appendix for further details. During a charrette, the community outreach effort from September 2014, numerous ideas to improve each area were brought forth. Some of those included creating great streets, magnetic public places and maximizing connectivity. The input generated include trenching the train tracks in the Village, making Grand Avenue more pedestrian friendly with a promenade, construct public plazas at Grand Avenue and State Street among other locations, improve streets, upgrade sidewalks west of Carlsbad Boulevard and add a tunnel under Interstate 5 connection Grand Avenue to the east side. As for trenching the tracks, Donnell said streets such as Oak, Pine and Chestnut could connect further west. In addition, the Village Central Green could also emerge from trenching as covered tracks could form public gathering places lined with trees. 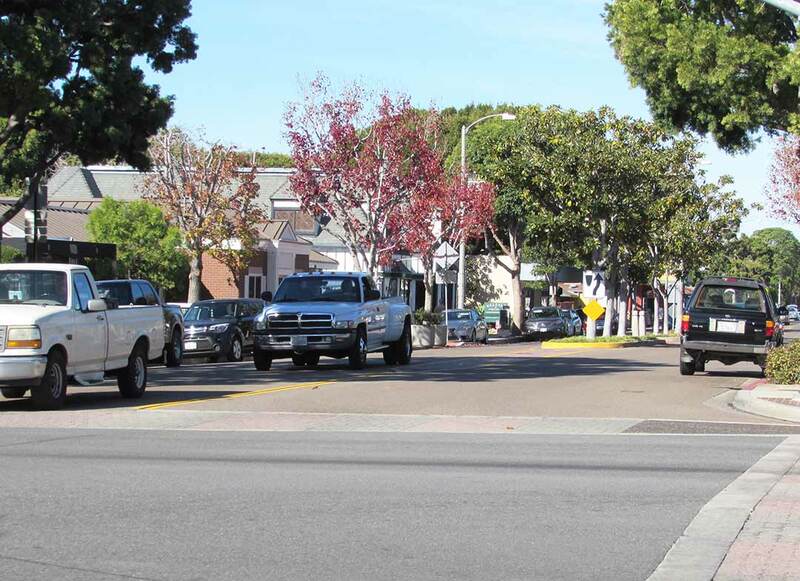 Another option is to close a portion of Lincoln Street, between Carlsbad Boulevard and Oak Street. “The master plan suggest this would be a good place for a public gathering place,” Donnell said. Ideas for the Barrio, meanwhile, include adding trees and pedestrian-scaled lighting along the streets, construct a roundabout at Tamarack Avenue and Jefferson Street to create a gateway to the Barrio and beach and ensure new development keeps the current character of the neighborhood. One idea at the intersection of Roosevelt and Walnut streets includes a meeting place, easing traffic speeds, wider sidewalks and perhaps additional parking. The mobility plan to address strategies to access both areas via train, car or by foot. In addition, a commission would be created to recommend to the city council approval for parking structures among other responsibilities. Adding parking structures, Donnell said, would create one area for residents and visitors to park, thus encouraging those people to walk around the Village. “Once there, hopefully visitors would park just once,” he added. The timeline, meanwhile, includes the environmental public review from Jan. 19, 2016, through Feb. 18. The plan will be presented to the planning commission on March 16 and to the city council on April 26 for approval, Donnell said. An open house is scheduled for Dec. 15 through Dec. 17 from 9 a.m. to 3 p.m. each day at the Carlsbad Inn Beach Resort Village Terrace, 3075 Carlsbad Blvd., above the Daily News Cafe. On Dec. 15, the city will hold a plan presentation and workshop from 6-8 p.m. at the Carlsbad Senior Center, 799 Pine Ave. A closing presentation and workshop will be held at the same time and place Dec. 17. During the presentation, Mayor Matt Hall and councilman Mark Packard recused themselves for conflicts of interest. Hall and Packard said they have property in the areas being discussed. The city hired the consulting firm Dover, Kohl & Partners, based in Florida, to assist with the plan. For details about the proposal, visit carlsbadca.gov/villagebarrio.